Riviera Nayarit Mexico Blog: The Festival Sayulita Is Back And Better Than Ever! The Festival Sayulita Is Back And Better Than Ever! The Riviera Nayarit’s hippie chic enclave offers visitors art, sports, sun and sand under the banner Film, Music, Spirits & Surf; think pairings, a surf tournament, movies, concerts and much more; highlights include the band Dirty Heads and surf pros. 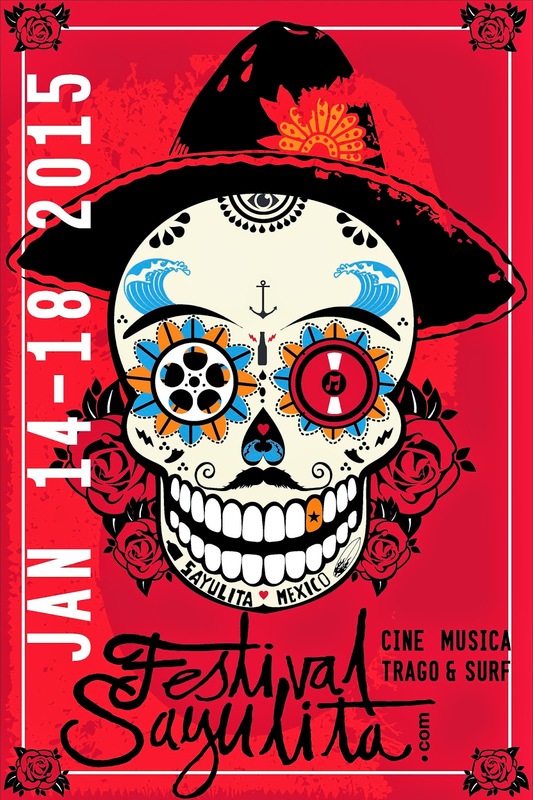 The Festival Sayulita is back, bringing its trademark Film, Music, Spirits & Surf from January 14-18. Now in its second year, it’s upped its activities roster and added something for everyone. A perfect mix of art, sports, gastronomy, sun and sand make for an all-inclusive ambiance in the Riviera Nayarit's hippie chic enclave. This dream made its debut a year ago and is now coming into its own. "This was a decision made amongst a small group of individuals in order to promote our town," explained Gabriel Villarubia, one of the founders. "Each of us had separately wanted to do a tequila festival, a film festival and a music festival, so we basically decided to do it all together. It was a small gathering last year and it was very cool; this year it's going to be even better. Plus we had a lot of support from the Riviera Nayarit CVB and the authorities." One of the standout novelties this time around is the special Friday list of activities just for kids and teens. They’ll be able to enjoy a kid’s rock band, as well as view the movie “Box Trolls” and enjoy a chat with one of the producers who will be on hand to explain the art of stop motion. There will also be a friendly surf tournament where they can share the waves with the pros. Another new activity is the 5-10K Fun Run, which will take place Thursday morning, the first day of the festival. Regarding the Longboard Surf Tournament, Villarubia announced it’s the largest in Latin America and will include the participation of local notables such as Fernando Stalla and Javier “Bicho” Jiménez, as well as the Riviera Nayarit crew and international stars such as Alex Knost, among others. The tournament will be held on Saturday with a prize of $10,000 USD. Event goers will have access to tequila, beer, mescal and Mexican wine in order to support domestic producers. Of course, the regional gastronomy is a must, holding court on Thursday night with a Wine Pairing and on Sunday with a Master Tasting during the surf awards ceremony. And, per tradition, there will be film presentations in different spots, with a place of honor held by the big screen right on the beach. The Dirty Heads will headline Saturday’s big concert (pun intended). There’s a lot going on so click the link to visit the official event page and take a peek at the entire schedule: http://www.festivalsayulita.com/.